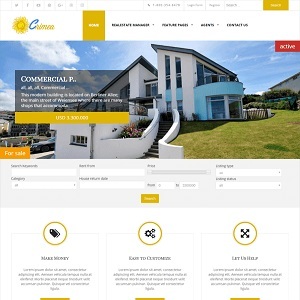 Crimea is unique Joomla 3.8.x real estate template with vivid and colorful design and professional functionality of Real Estate Manager - flexible and dynamic solution for real estate website management. Crimea is tailored for real estate business, agents and brokers, real estate listing websites, property industry, for local and nation-wide real estate and real property or immovable property as it has everything you need to build a real estate website. Crimea real estate website template is fully responsive (major mobiles and tablets compatible), multi-browser supported (Chrome, Firefox, Safari, Opera, IE 9+), has a variety of template options for customization and is intuitive in use. Real Estate Manager has bunch of features for renting and selling properties, managing buy and rent requests, advanced search functionality, location map with marked properties and many more features to build fully functional real estate listing website. The homepage of Crimea Joomla real estate template will attract your users with engaging search module, the featured services section, last added properties, featured properties and video block. Also in template you'll find the predesigned Joomla content pages, Bootstrap elements and all pages from Real Estate Manager. In Quickstart package you will find template, Real Estate Manager, responsive touch screen slideshow, REM Featured module and other addons. Documentation and support are also included. Plenty of module positionsDue to Joomla Blank template, Crimea comes with a wealth of module positions to place your content exactly where you want it. Cross-Browser CompatibilityCrimea Joomla template fully compatible with all browsers: Chrome, Firefox, Safari, Opera and Internet Explorer 9+.